Inter got back on track last weekend with a dominant victory over relegation threatened, Udinese and looked to follow that up with another victory over Sassuolo who have nothing to play after placing themselves around the mid-table positions. So, whilst Inter have it all to play for in order to keep up with Lazio heading into the final matchday with a UEFA Champions League place still up for grabs, the away side came to the Giuseppe Meazza in party mode on the face of things however they did have the chance of doing the double over Inter this season so they weren’t to be underestimated. Spalletti made a couple of changes to the side that won 4-0 last weekend by reverting back to a ‘safe’ side. The changes were players who were now back from suspension (D’Ambrosio & Vecino) so unsurprisingly they took their places back in the starting line-up. The rest of the team remained the same with rotation being a major problem for Inter this season. Giuseppe Iachini made one change to his side that beat Sampdoria last weekend with Stefano Sensi being replaced by Francesco Magnanelli in the heart of their midfield. They yet again stuck to their resilient 3-5-2 counter-attacking formation which has seen them only lose one game in their previous ten matches whilst winning four of them. 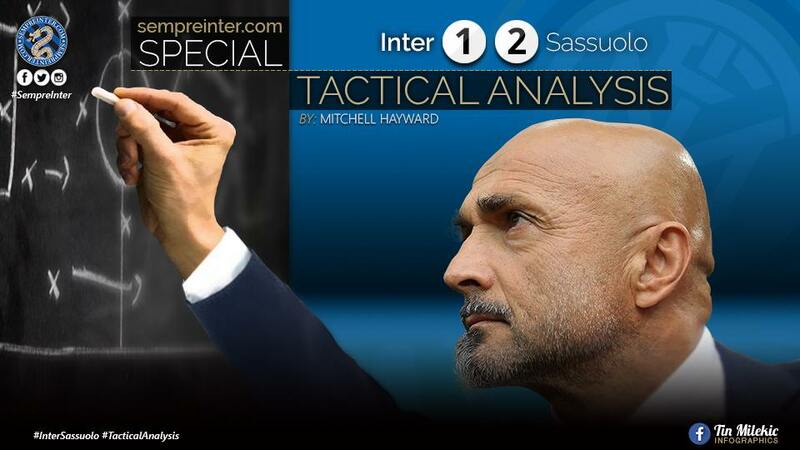 Being well-structured would always be key for Sassuolo and it’s something many sides haven’t been against Inter this season, Udinese last week for example who also played a 3-5-2. 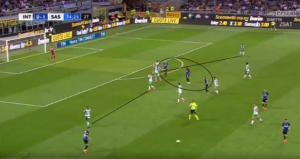 Their structure could be seen from the off as they clearly wanted to cut off the passing lane to Inter’s two main orchestrators, Rafinha and Brozović. They used their forward line as well as a midfielder to help to cut off the options. As you can see, each player for Sassuolo in this above image knows their role and where they need to be. Magnanelli and Duncan are cutting off Rafinha whilst Missiroli can be seen almost forming a front three to help Berardi cut off Inter’s #77 whilst also being able to press D’Ambrosio should he receive the ball. Overall, Škriniar who is the ball carrier has very limited options and will have to either go backwards, sideways or attempt an unrealistic pass forward. In order to break this great structure down, off the ball movement and quick passing would be a must. With Inter struggling to get anything really going, Spalletti instructed that Brozović drop deeper, collecting the ball from the centre backs with them then spreading wider along with Vecino and Rafinha. This made things harder for Sassuolo in terms of cutting off passing lanes since Inter were more spread out with a regista type player now being used. 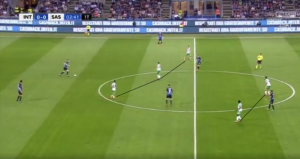 The midfield is spread out whilst Sassuolo are very compact and the fullbacks are touching the sideline which forces the away side to open up a bit to close down and cover spaces/passing lanes. 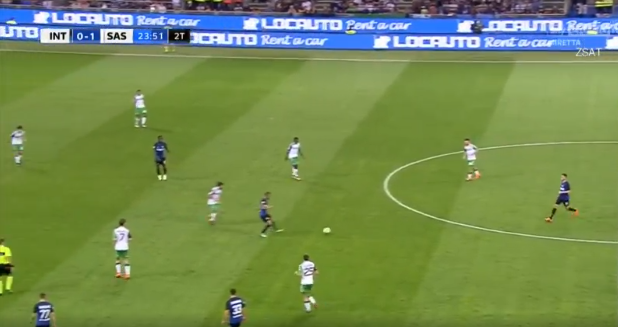 As I mentioned previously, Sassuolo set up to catch teams on the counter and that was no different here. 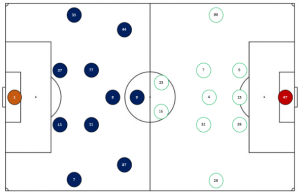 With Inter playing a high line in order to press higher up the pitch, the Neroverdi’s forwards would look to play on the last man and get in behind with slick movement. 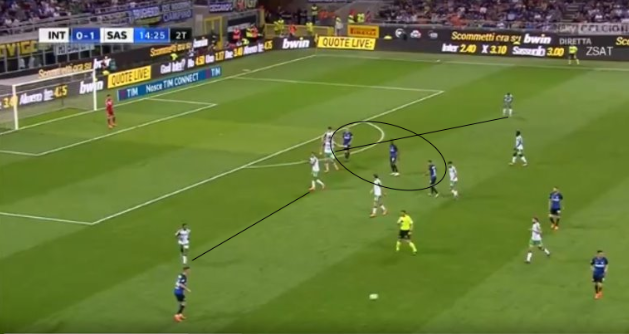 Berardi here made a slight movement towards the ball carrier and then darted back the other way to make his run after he pulled Škriniar out of position slightly. Fortunately, the Slovak is no slouch so he managed to catch up but against Ranocchia and many other centre backs in this league, he would have had a great chance to double their lead. Inter looked to continue to dominate possession in the hope of gaps opening up via tired legs but like I mentioned in the first half, Sassuolo were very well organised and well structured. 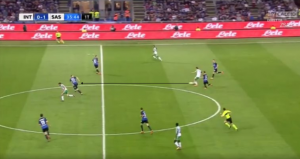 Their back three and midfield three kept very tight and compact, not allowing the play to go through the most dangerous part of the pitch, forcing the Nerazzurri outwide however their wingbacks would stay fairly wide, especially Rogério since he was defending against the attack minded, João Cancelo. This meant Inter had to exploit the half spaces since no one was really occupying them for the men in white but that failed to happen. Icardi, Karamoh and Rafinha can all be seen in the same space when the area to exploit is between the wingbacks and centre backs. Magnanelli was put into the side for a specific reason and that was to give Rafinha no space to pull the strings as he likes to do. The Brazilian couldn’t find any space in between the lines, his overall movement was lacklustre and every time he attempted to pick the ball up from deep, he had Magnanelli chopping at his heels. Rafinha has no space to turn and even if he manages to get past his man, there are two other midfielders ready to pounce onto him due to their narrowness. This is where Cancelo needs to provide width for Rafinha and to pull out the wingback. As you can see, the Portuguese is nowhere to be seen. With 20 minutes to go, losing the game at home, this is unacceptable from the RB and his inconsistency is causing major issues. Both managers made changes near the end with Spalletti knowing that anything less than a win would give Lazio the chance to seal their UEFA Champions League qualification before the final day of the season so he took off Vecino for Éder whilst Sassuolo manager Iachini removed both forwards after their immense shift for the team, putting on Babacar for his physical presence and ability to hold up the ball, as well as Ragusa. Inter continued to dominate the ball, even scoring via Rafinha and also creating some glorious opportunities that were not put away so in the end, it was a defeat for Inter which meant Sassuolo had done the double over the men in black and blue this season. The players let Spalletti, the club, the fans and themselves down with this result. They knew that they more than likely had to win to still have a chance of making the season goal of top four and that’s the performance they put in? It was too lethargic, lacked any drive, any real enthusiasm. Yes, we had our chances but still, we should not be defending as a team the way we did. Fortunately for us, Lazio also didn’t win their match this weekend meaning the final UEFA Champions League spot will be decided on the final day in Rome. I said a few weeks back that all we could realistically hope for was the chance to still get into the top four on the final day of the season and we have that. A victory and we’re in. Yes, this was a terrible result and we’ve had a few like this throughout the season however we’re here now. The final matchday of the season, we win and we’re back where we belong, amongst Europe’s elite. FORZA INTER!